Don't go expecting some wild revelation about me based on the title; I'm talking about some of my old stuff I found in my parents closet the other day while cleaning up their house. It hadn't seen daylight in a long time. A while back I mentioned how we used to frequent Chris and Pitts BBQ. It was good and it was cheap. Dennis, Teri and I ran across the place one evening after returning from a Yototake West L.A. Accordian Band playout up in Fresno. 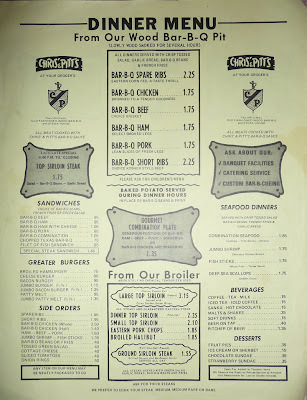 As we got into town we looked for a place to eat and lucked out by running into this restaurant on Sawtelle in West L.A. before it was a trendy street. 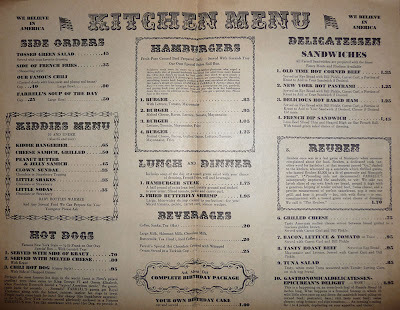 I found a menu, which I uploaded so you can wax nostalgic about how much lower food prices were back in 1972 or 1973. Click on the pictures to see a larger version that is easier to read. Look at that.. 15 cents for a soda! 95 cents for a sandwich with fries! $1.45 for a merchant bbq rib lunch with fries and a salad and garlic bread.. I was always confused by their "merchant lunches." Did you have to be a merchant to order them? What kind of merchant? Chris and Pitts was a place to get a good square bbq meal at a decent price. Many of you - well, I shouldn't say 'many of you' since probably hardly anyone reads this so I'll change it to 'a good proportion of you' (which could be 2 of 3 or 3 of 4.. something like that) will remember the place below. We'd go to either the one in Torrance or Woodland Hills. Do you remember the commotion when someone ordered the Zoo? Same thing for that Gastronomical..sandwich. David and I splurged and ordered it one time, suffering through the clanging bells and sirens and the attention it brought us. We wound up taking most of it home as it was way too big. 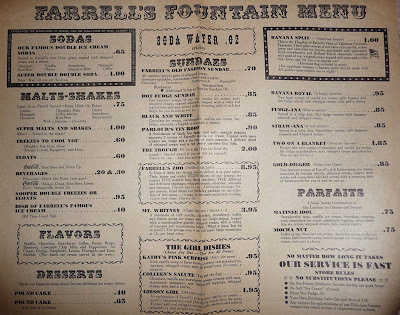 $4.95 was a steep sum for us back then. 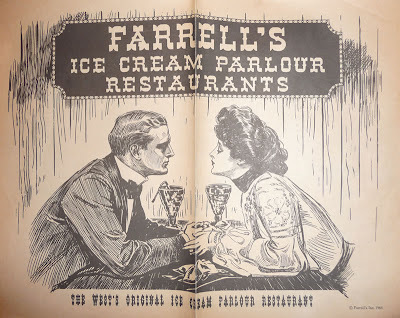 I always thought Farrells was overpriced. I never cared for it much anyway. Most of the times we went there was with a big group of people, such as a club outing and being that I wasn't Mr. Social, I generally was just one of the onlookers. 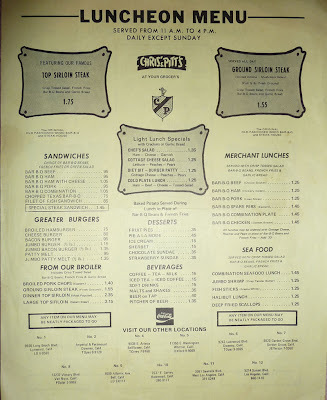 What kind of memories came back to you when you saw the menu picture? Oh, and along with those menus I found a lot of short, stupid things I had written in high school and I do mean stoopid. Yesterday I told you how I found a story of mine from 1978 and how much the thought process and style still resembled the way I am now. Well, go back six or seven years from that point to high school and it was completely different! The stuff I wrote was terrible! You might be saying, so what has really changed? True.. but it was even more terribler back then. You will not be seeing any reprints thereof. I can tell you, though, that there seemed to be common themes interwoven through most of that amateurish assortment of scribblings - a slant towards the irreverant and unconventional, as well as an underlying longing to be unconfined, or free. Free of what? School is the obvious answer, but deeper down it was that same longing feeling I wrote about here a few days ago, the one that would come to me while sitting in my room getting lost in my records every night. These were just some of the things I stuffed into a bag while going through the closet. I still have to pull out the other half and look through it so stay tuned. I thought most of them had been thrown away long ago.